Local GAA club Carrickcruppen was one of 18 local organisations to benefit from nearly £10,000 of funding from Danske Bank in recent months. The Camlough club received £485 through the Danske Volunteer Grants programme, which provides grants to local organisations with which Danske employees are involved outside of work. 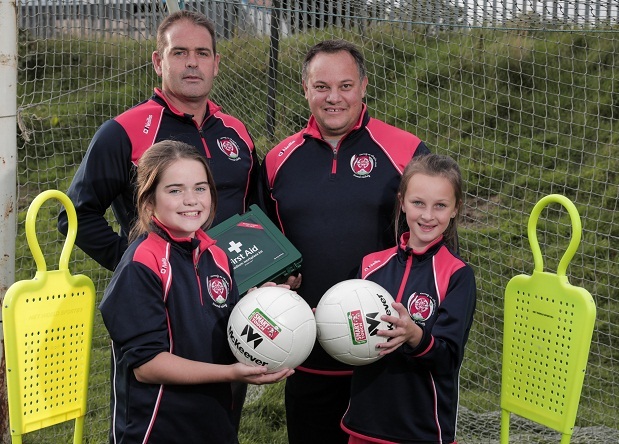 Danske Bank employee, Dave Scott, a coach with Carrickcruppen’s girls’ U10s football team, applied for the funding to help support the further development of ladies football within the club. Rory Coffey, a Youth Coach at Carrickcruppen, said, “We currently have 53 girls enrolled for our U10 team. Our club offers girls the chance to not only develop their sporting abilities but to meet new friends and improve their social skills. “This additional funding from Danske Bank means we have been able to invest in extra equipment including; new footballs, manequinns and slalom poles. As a result, we’ll be able to further develop players’ agility and teach more than just basic skills,” he added. Rachel Cleary, External Communications Officer at Danske Bank said, “We recognise the value of volunteering and appreciate that many of our employees share their time, skills and expertise outside of work in our local communities. “Through the Danske Volunteer Grants programme we can support colleagues like Dave, who are making a real difference in their local community,” she added.